Lynne Thomas of NIU, Dave McCarty, Steven H Silver and Helen Montgomery of Chicon 7. Photo by Elaine Silver. 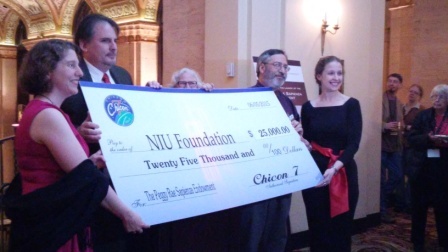 Chicon 7 has created the Peggy Rae Sapienza Endowment at Northern Illinois University in DeKalb using surplus funds. The purpose of the fund is to provide financial support to benefit the Northern Illinois University Library, Special Collections, enabling the procurement, preservation, and promotion of materials germane to the study of Science Fiction, Fantasy and Horror and their fandoms. The initial endowment of $25,000 was made at a Reception during the Nebula Award Weekend in Chicago and represents the last of Chicon 7’s surplus. Steven H Silver, who was one of three Chicon 7 Vice Chairs, will serve as the fund’s trustee. Chicon invites other individuals and organizations to donate to the endowment in Peggy Rae’s honor.